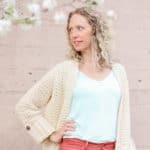 Free Crochet Cardigan Pattern + Video Tutorial - Lightweight, Modern and Cute! 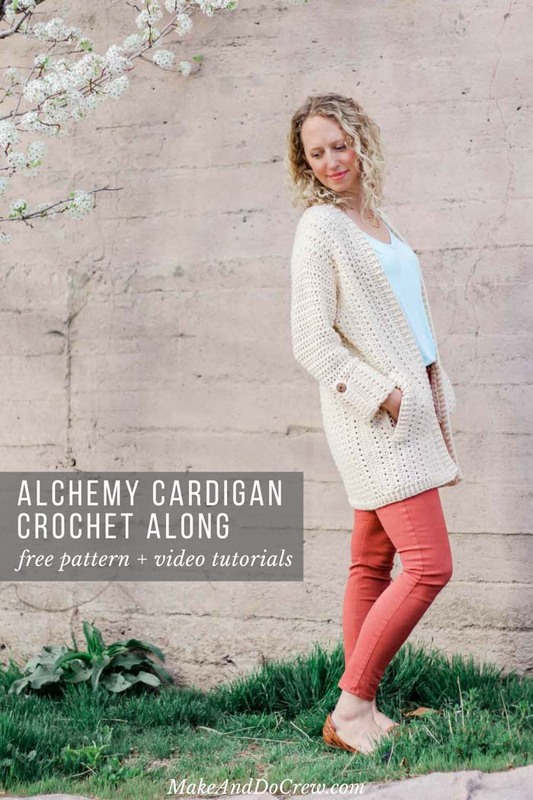 In the second stage of the Alchemy Cardigan Crochet Along, we’ll learn how to crochet both front pieces of this summery sweater. Part 2 of the free pattern and video tutorial are below, or you can purchase the ad-free, easily printable PDF with stitch chart and schematic here. Look for Part 3 next Monday! 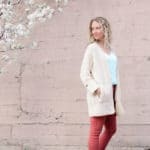 This free cardigan pattern and video tutorial are part of a collaboration with my friends at LoveCrochet.com. This post contains affiliate links. Oookay, friends! Who’s excited to move onto Part 2 of the pattern this week? My buddies at LoveCrochet.com and I have been BLOWN AWAY by how fast and beautifully some of you have completed Part 1. It’s been so fun to watch all the progress you’re making in the Crochet Along Facebook Group. 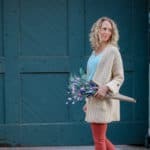 If you haven’t joined yet, it’s a great place to get help if you’re struggling or see inspiration from other crocheters who are working right alongside you. The community aspect of this crochet along is one of my favorite parts. • Purchase the ad-free, printable PDF with stitch chart and schematic here. • Start Part 1 of the free pattern and video tutorial here. • Ask questions and show off your stitches in the helpful Love Crochet CAL Facebook group here. 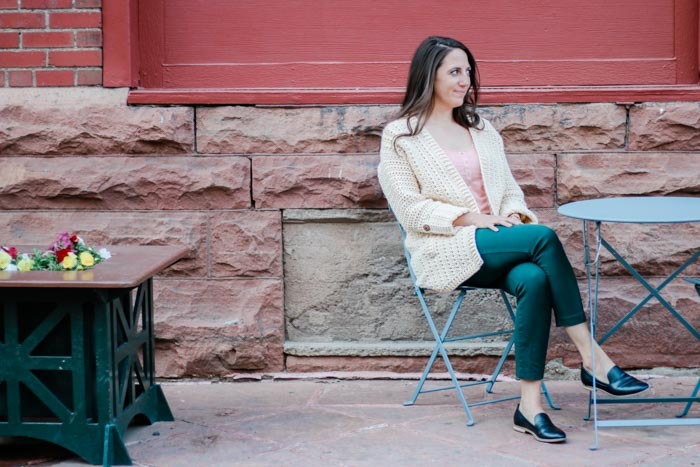 This week, we’re going to learn how to make the two front pieces of your crochet cardigan. The awesome thing this week is that you’re already an old pro at everything you need to know! The fronts are worked very similarly to the back piece and should result in the same shoulder slant and armhole shape. 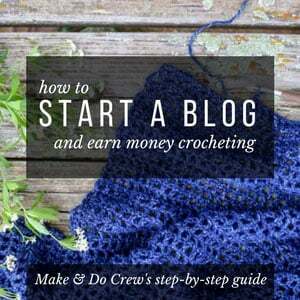 As a reminder to the couch crocheters like me, you can purchase the ad-free PDF that’s formatted for easy printing right here. It’s includes a stitch chart and schematic with a lot of extra measurements, plus all the tutorial photos that are included in each blog post. Alright, without further ado, find the Part 2 video tutorial below and Part 2 of the free pattern directly below the video player. And I’ll see you right back here next Monday where we’ll learn how to make the sleeves! Find Part 1 of the free pattern here. • Because there’s a definite RS and WS of fabric, we’ll be working two reflecting pieces for the front. 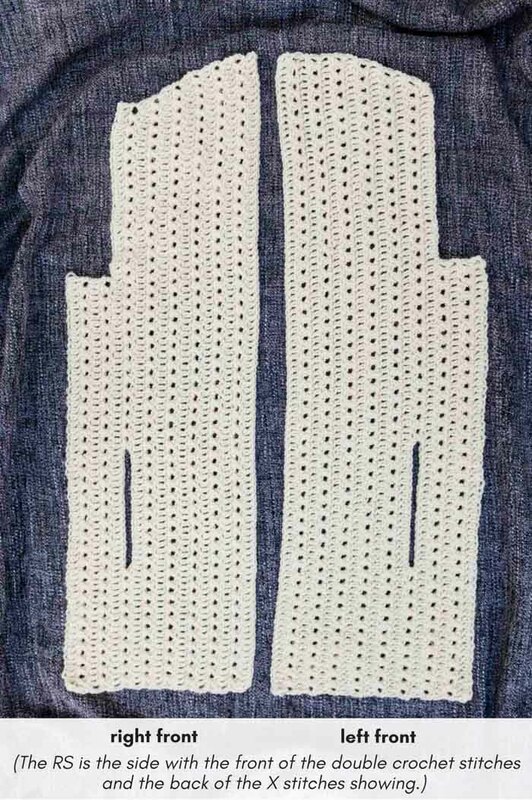 These will mimic the exact shape of the right and left sides of the sweater back. • Pocket slit is optional. Continue working regular double crochet Xs to eliminate pockets. • Replace Foundation Row and Row 1 with one single row of foundation double crochet if desired. Work 64 (66, 66, 68, 68, 70, 70) total fdc in this case. Attach a second ball of yarn in tch at beginning of Row 4. Continue Row 1 of next section with original ball of yarn. Row 1 (RS): Ch 3, sk first dc, dc in each dc and ch to end of row; turn. TIP: Count your stitches to ensure there are the correct number of double crochets after adding the new chain. Rows 4-5 (7, 9, 11, 13, 15, 17): Continuing in established pattern, rep a RS inc Row every RS row, 1 (2, 1, 0, 1, 0, 1) time(s), then rep a RS inc Row every other RS row, 0 (0, 1, 2, 2, 3, 3) time(s). At the end of increasing there are 94 (100, 102, 106, 110, 114, 118) dc. TIP: To see row-by-row instructions in layman’s terms for the increase rows above (Rows 4-5 (7, 9, 11, 13, 15, 17), reference the Back section of the pattern. While the increase for the Right Front is worked at the end of the dc row instead of the beginning, the actual frequency of dc increase rows and X rows does not differ from the Back. • Left front is worked identically to the first portion of the Back section. Review the Back section video tutorial for extra help (Part 1). TIP: To see row-by-row instructions in layman’s terms for the increase rows above (Rows 4-5 (7, 9, 11, 13, 15, 17), reference the Back section of the pattern. Woohoo! You’re halfway done with the crochet along! In Part 3, we’ll learn how to make the lightweight, cuffed sleeves. I’ve been waiting for Part 2 before starting…I plan on making the Fronts and Back in one continuous piece to eliminate the side seams. I cannot get Vanna’s Style in Canada, so I will also be fudging the yarn, making sure to do a swatch first. That sounds like fun! While I think it might have been too complicated for the general pattern, I absolutely love the idea of trying any sweater this way! I used Joy DK by Loops and Threads, it’s been working really well. Yay! I’m so excited to get started!! I’m confused about the amount of yarn needed. Can’t find Vanna’s Style and would like to substitute with a cotton blend. Your pattern says 6 skeins of 254 yards each skein for Vanna’s Style for the smallest size; wouldn’t that be 1524 yards total? Or, 3.5 ounces times 6 skeins = 21 ounces. What does the “approx 570 (640,710, …) refer to? Thanks for the feedback, Dawn. I understand where you’re coming from. I try to tow the line between keeping these videos a manageable length and also very helpful to the most people. Do you feel like you’ve got the hang of it now? Hi Jess, I am a little confused, On the Right front section at shoulder increasing Row 2 (WS pocket slit, it is written as “Rep. from * (25(26,27,28, 29, 30, 31) more times (26,(27,28, 29, 30, 31, 32) Xs made. Then on Left front section at shoulder increasing Row 2 (WS pocket slit, it is written as “Rep. from * 8 (9,9,10,10,11,11) more times. 9(10,10, 11,11, 12,12) Xs made. I am not sure if I am understanding that it is supposed to be written the same or different. It is confusing. I watched the videos but I can not follow the video and check out how the pattern is written at the same time. I hope you can understand what I am trying to say. It may just be a typo. Thank you very much for your time. I love this so much and really want to make it. Great question and I do think I understand what you’re asking. They are intentionally different because you’re working two different front sections that mirror each other. So on one, you’re coming at the pocket from the top down and on the other, you’re working from the bottom up. That’s where the difference in numbers of Xs comes from. Does that make sense? Hola! Quisiera saber cuando sale la parte 3, realmente las 2 partes las acabe muy rapido y muero de ganas por estrenarlo. Yes Jess, and thank you for clarifying that. I think I kind of figured it out that, that was the way it was supposed to be but only after I had left the message. Thank you again for getting back to me.